Fed chair, Janet Yellen was at Capitol Hill this week, testifying before Congress. Among the many questions posed to Janet Yellen by lawmakers in Congress were her thoughts about regulatory reforms, tax cuts and the possible repeal of Dodd-Frank. Republican Senator from Tennessee, Bob Corker questioned Yellen about the economic effects of an overhaul of Obamacare, tax changes and regulatory measures. Of course, the whole point of making such dramatic changes is to accelerate growth in the United States by removing the vestiges of the past that constrained economic growth. Excess regulations are economically burdensome on companies, although they are designed to safeguard the public. Dodd-Frank was put into place to counter the recklessness of the big banks on Wall Street that precipitated the Global Financial Crisis in 2008. However, President Trump is having none of it and wants to completely replace what he considers to be an antiquated and economically harmful series of regulations. Dodd-Frank comprises 2,300+ pages of complex legislation. It emphasizes government control over the finance sector, and puts in place Stress Tests to ensure that banks are liquid enough to sustain another financial crisis. It is targeted at banks with holdings of $50 billion, and at times requires a cushion of 3% in cash holdings of all assets under the banks’ control. Banks that fail the Stress Test are slapped with punitive measures, and operate under an umbrella of blacklisted companies. For Yellen, many of these questions are open-ended. She was measured in her response to Congress and stated that the Fed would have to carefully weigh any shifts in policy. She is also a firm adherent of health insurance, and cautioned against repealing and replacing Obamacare. 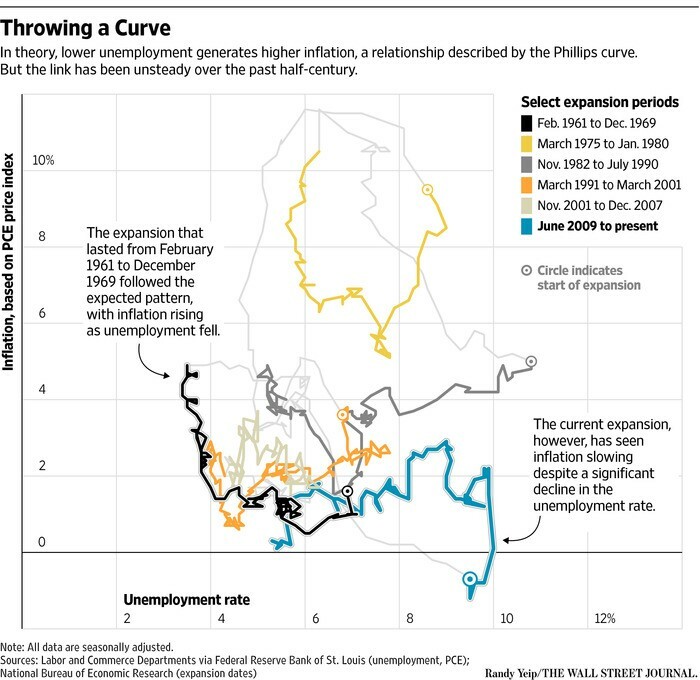 Fed chair Yellen is also uncertain whether the relationship between NFP data and inflation holds true with the proverbial Phillips curve. Market participants who adhere to traditional trading practices are at a loss. When trading economic trends, decreasing unemployment is typically coupled with rising inflation. This is not happening in the US. What are Yellen’s thoughts about President Donald Trump’s Fiscal Policies? Janet Yellen was reluctant to divulge too much information about how Fed policy would be affected by President Trump. The private sector has no qualms about Trump’s policies, because they believe that many of his economic plans are pro-growth. For the Fed, the macroeconomic perspective is more complex. Yellen stated that there is no clarity vis-à-vis Trump’s policies as yet. Once a plan has been put into place, the Fed will likely work alongside the government to ensure that full employment, price stability and inflation targets are met. 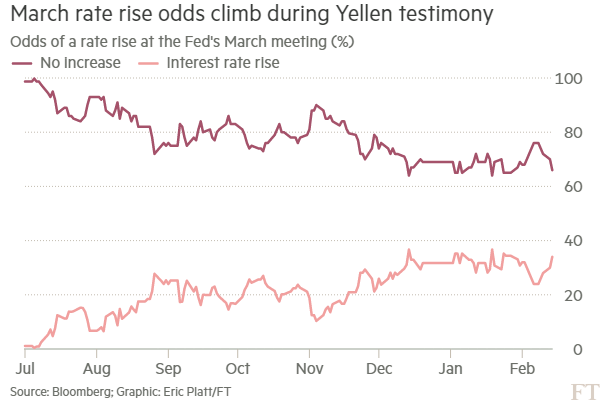 With regards to interest rates, we can expect the Fed to hike rates in March when the FOMC meets again. Currently, the federal funds rate is standing at 0.50% – 0.75%, but the possibility of rate hikes coming sooner, rather than later is growing. This is now being priced into equities markets which are cooling. The USD is also strengthening on the back of the Yellen’scomments. Recall that the greenback prospers with rate hikes because less USD will be in circulation and more will be demanded. Interest rate hikes are bad for stocks because the companies that borrow heavily to finance their operations will now be paying more to banks and financial institutions in interest repayments. So, stock prices will retreat accordingly.